Tripod celebrates his 2nd birthday on 21 April 1999 -- a milestone that most hamsters never reach, due to their naturally short lifespan. But Tripod, even though he has just three legs, has surmounted the odds and joins the ranks of "senior hamsters." 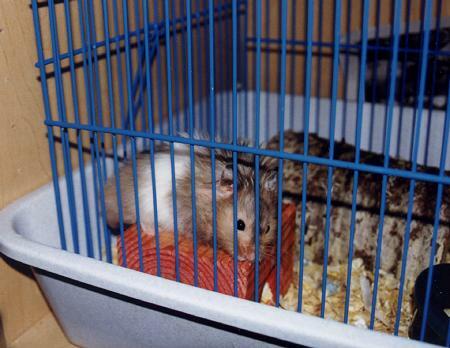 The above picture of Tripod in his cage was taken in early April 1999.